Genealogist at any level will follow the basic steps to locate information. Our goal is to find information or leads that document our ancestor’s life. There is a need to talk to family and others in hopes of a connection to our ancestors. First, we try to figure out what we “already know” about our ancestor then, what we “need to know”, such as where an ancestor was born, married or died, and last, who knows “what we need to know.” This will lead us to the state or local vital statistics records. We know we can obtain these records if they exist by writing and requesting a copy or ordering online. We wander aimlessly throughout courthouses seeking land records, such as a deed or bill of sale, or any type of public records. We like to ask questions-where did uncle Carl grow up, where did he attend school, what is your grandma’s name, did great grandpa Govan own any land, or how many children did great great grandfather Ambrose have, what are the children’s names, etc. Second, genealogists tend to contact historical societies, libraries, and genealogy groups for local information and any information on your family. Learning about the local history is key to a genealogist research, as your ancestor might have been involved with local events. Third, networking with others is vital, it can save you time, provide new questions to ask and lead you on other research trips. Researchers will seek out others researching the same surnames. It is highly recommended that you visit the area where you are conducting genealogy research; you never know where you might make a connection. Recently, I was visiting distance relatives in Knoxville TN and shared that my paternal grandmother, Viola Cureton was born in Loudon County and I believed her grandfather Ambrose Cureton, born about 1840 died in Loudon County. I was informed that Loudon County was only about 15 minutes down the road and they knew a few local folks. I was introduced, offered a cold bottle of beer and of course as any good genealogist would do, told the folks that my daddy’s people are from Loudon. One gentleman says his family has always been in Loudon. I asked if he was familiar with any Cureton’s? 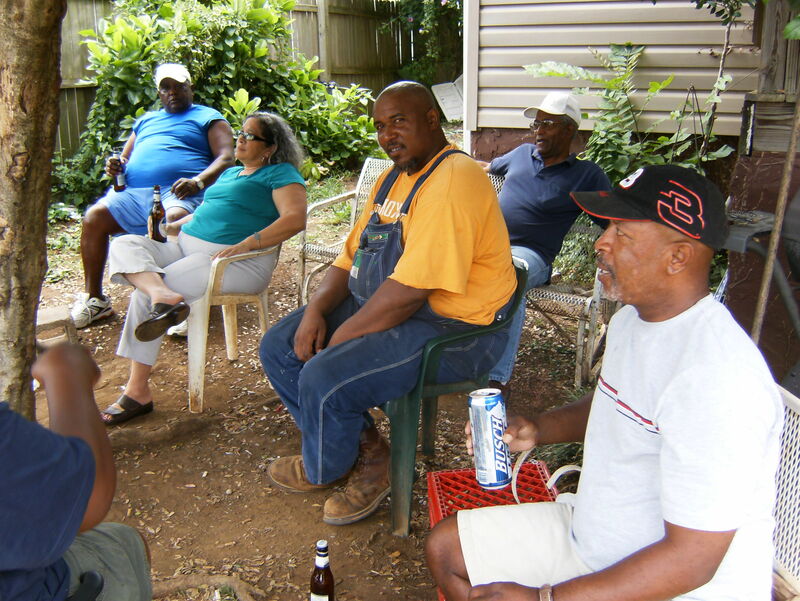 He says that he is not familiar with that name but most of the Black folks in the area are related and he was sure we were related since the timeframe was 1880 to 1910. Again, he remarked, my people have always been here. We continued to chat about the area with the gentlemen sharing local history about the railroad, churches, 2 Black cemeteries, etc. This is what I call “talking story” and enjoyed ever minute. I didn’t think it was appropriate to pull out my pad and take notes and was praying that I would remember the surnames and events mentioned, such as the Howard and Hawkins families. Once I returned home the first thing I did was drop my bags inside the door and logged into Ancestry.com to see if my Cureton’s had Howard or Hawkins neighbors in 1880. Well low and behold, I found Howard’s and Hawkins living near the Cureton’s, plus a Loudon County1898 marriage record for a Howard and Cureton. Just like he said, we are probably related. I met some fabulous folks and made some lasting relationships. Just remember while researching your family tree, you never know where you will find information about ancestors, sometimes it might be under a tree. 3 Responses to You never know what you will find under a tree! Part 2 of my quest to locate Ambrose Cureton has began this morning. I remembered my visit to Loudon County, TN a few years ago. As mentioned I have Ambrose and now wife Lue J. (Grinway) in the 1880 census in Loudon Co. I remembered this blog about meeting folks and having a beer under the tree. It was time to revisit my notes about this day and plan a trip to Loudon County. I need to find out where Ambrose died. I have narrowed it down that Ambrose died after 1880 and before 1903. Why 1903, because I just located his wife Lue/Lula in 1903 city directory in Knox County and she is a widow and Black. (love the city directories) Lue dies in Knox County TN. Now Ambrose’s son Govan is also in Knox County, so I am not sure – yet- if Ambrose made it to Knox County also. I also have to separate the Cureton’s by race to avoid confusion and stay on track with the right family. There is a white Govan born in Mecklenburg, NC around the same time as my Govan Cureton. So what’s my next move—find the death record between Loudon and Knox counties TN. Yes, you never know what you might find under a tree. I did get a death certificate for my 2x great aunt who died in Loudon County TN in 1912, so good luck! It was very basic with just her name and death info, place of birth and age. No parent’s names.